Your Brainwave Signature Assessment tells you exactly what is happening in your brain and what you can do to have more energy, focus, clarity and happiness in your life. (This service is only available for clients in London). What is the brainwave signature assessment? 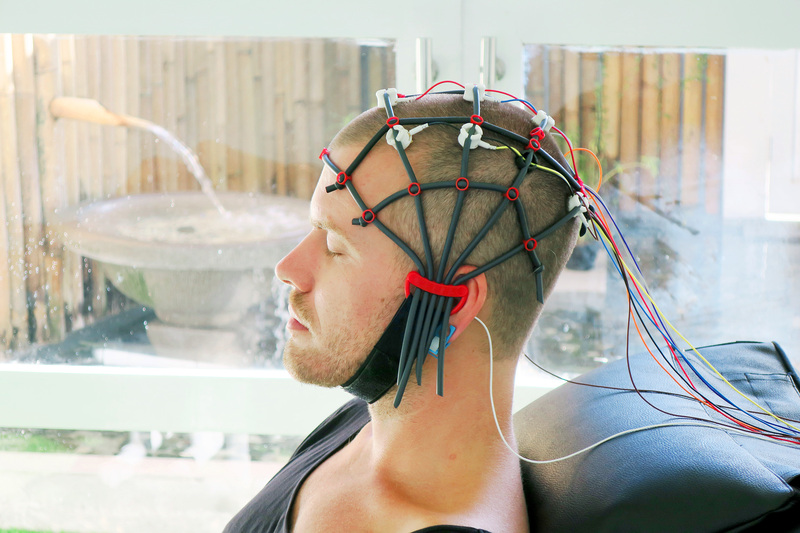 My technician comes to your location with advanced QEEG equipment to analyse your brainwave patterns using scalp surface sensors at key locations. There are specific key signatures that let you see your unique pattern of mental strengths and weaknesses, potential causes of health symptoms and causes for personal development challenges. These signatures allow us to make recommendations for meditation, supplements, diet and lifestyle personalized to your brain to help address these signatures. You also get recommendations for the best neurofeedback training protocols to reverse these signatures if you work with us on our home program. 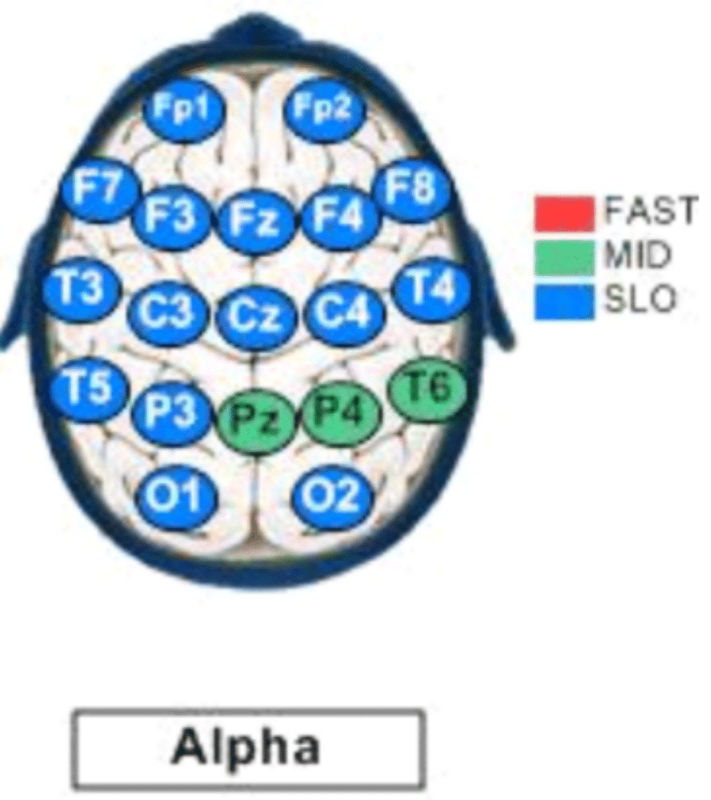 Mental Fatigue From Slowed Alpha: Mental fatigue, cognitive inefficiency and a sluggish brain ‘pacemaker’ are associated with slowed alpha brainwaves as well as metabolic issues from thyroid and adrenals. 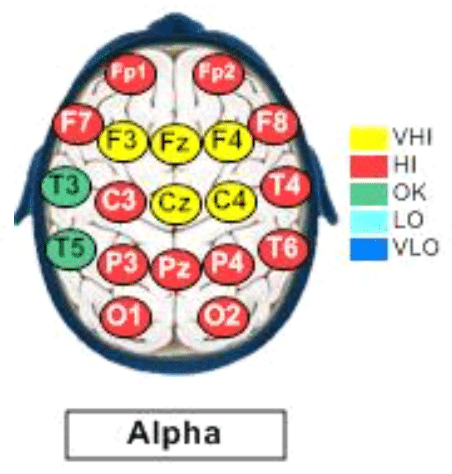 The majority of alpha brainwave activity (8hz – 12hz) should be between 9.5 and 10.5hz. 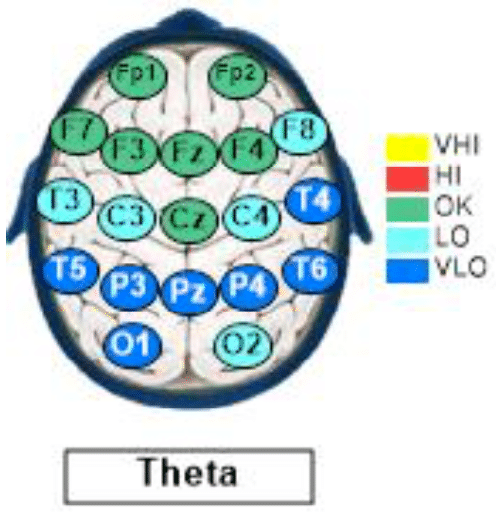 When the majority of activity is between 8hz and 9hz then these problems can arise..
Low stress tolerance from low posterior theta: Low stress tolerance, low resilience, non-restorative sleep, toxic stress, trouble finding brain’s ‘off switch’ and a poor immune response are often found when theta brainwave activity (4hz-7hz) is low in the back of the head. 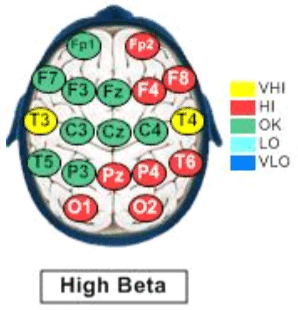 Worry & Rumination from Beta Backwards Brain: Worry, rumination, not able to turn off thoughts, difficulty relaxing and achieving peaceful mental states, trouble falling asleep easily and depleted GABA neurotransmitters are correlated with more beta brainwaves (15hz-20hz) in the back of the head than the front. Brainfog from Alpha Backwards Brain: More alpha in the front than in the back is associated with decreased mental clarity and slower cognition/brainfog and often seen in chronic fatigue, chronic lyme and fibromyalgia, burnout from stress. Anxiety from Beta Balance: More beta in the right frontal lobe than the left frontal lobe is correlated with rumination, hyperarousal ‘brain anxiety’ symptoms, problems ‘shutting off’ and trouble relaxing/letting go. 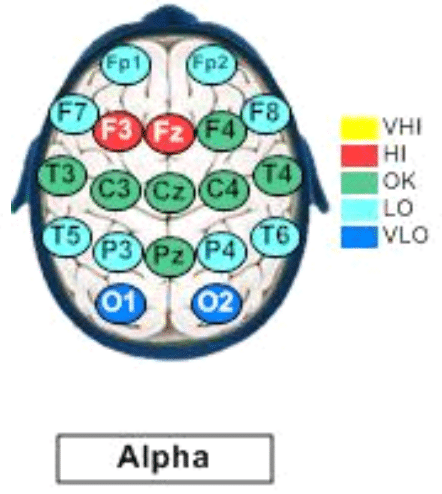 Depressed mood from Alpha Balance: More alpha in the left frontal lobe than the right frontal lobe is correlated with low/depressed moods, problems with motivation, waking up in the morning easily, food cravings for high serotonin foods and low mental energy. Brainwave signature assessment using QEEG brainwave reading technology was introduced more than 30 years ago and has been refined greatly with recent advancements in technology. It is used in most major neurology departments, peak performance programs in the corporate world and in professional athletics and olympians to enhance mental performance and to guide treatment for conditions such as ADHD, depression, PTSD, anxiety + emotional issues. In your 1 hour consultation you will get to review all your results with Dr Dani. There are many mystery behaviours, personality quirks, health conditions and barriers to peak mental performance that have confused or drained our clients for years without them getting answers for which we have been able to find a specific cause and recommend a specific course of action. You will come away understanding yourself more completely than ever before with a very clear roadmap and plan for how you can fulfil your potential and become the best possible version of you.